AlekH wrote: Lose the cheese, hit it with some hot sauce and I'd eat it. And color me surprised that McDonalds hasn't unleashed a relatively tasty crispy fried veggie patty, seems like a no brainer. I'd bet it's coming . . . from them and everyone else. To me this wasn't gross, just bland. Hot sauce certainly couldn't hurt. Also interesting (at least to me) that the veggie sliders are actually more caloric than the standard sliders. Not sure how many remember, but years ago McDonald's came out with a "healthy alternative." It was called the MacLean, a low-fat burger and no one wanted it. McDonald's discontinued it and the thinking was that people don't go to McDonald's for "health food." That was some years ago, though, and maybe now the time is right. McDonald's is fairly directionless today. They've been throwing way too much at the wall and little has been sticking. There's no question that people don't go there to eat healthy and adding a veggie burger isn't going to appeal to anyone. As noted with the White Castle veggie slider, to get a product that's palatable to consumers, it ends up being as caloric and fat-laden as a burger. spinynorman99 wrote: There's no question that people don't go there to eat healthy and adding a veggie burger isn't going to appeal to anyone. If I'm at a McDonalds it would be at lunchtime. I've got to disagree. I people watch and I always see a lot of folks with a McD's salads for their lunch meal. I've had a few too. Nice price point, good presentation, fresh ingredients. I don't doubt that there are times and locations where people will be ordering salads, but it's far from the norm. 75% of McDonald's sales are in drive-thrus and I don't doubt for a moment that very few of those sales are salads. ronnie_suburban wrote: Also interesting (at least to me) that the veggie sliders are actually more caloric than the standard sliders. True, but the veggie patties are significantly bigger. Using information from White Castle's website and subtracting the contribution of the bun, the 30 gram beef patty has 70 calories while the 43 gram veggie patty has 80 calories. Of the beef patty's 70 calories, 55 come from fat (that's 79%); of the veggie patty's 80 calories, 35 are from fat (44%). While not a prime example of healthy food, the veggie slider itself isn't as high in calories as some articles suggest. It's when the ranch dressing or other sauces are added that calorie counts climb. All true, but who would eat one of those veggie sliders without the bun and goo? True dat. I'm not one to dis the veggie burger (the Morningstar black bean and chipotle is especially good) but the lowest-common-denominator bland offering at most fast-food places needs the cheezy/saucy treatment to make it worth eating. Does it really matter? I never got the impression the veggie burger at fast-food places were supposed to be some sort of health-food alternative. I thought they were for people who, well, don't eat meat, for ethical reasons and/or religious ones. I personally have found vegetarian options to quite often be more caloric than meat options. See lacto-vegetarian Indian food, for example. When I want to eat low-calorie, I generally turn to lean proteins. Most vegetarian dishes that I enjoy are quite caloric and leave me feeling bloated because of all the carbs and fat. Isn't that why everyone carries hot sauce in their glove box? Recently in Louisville I used the ever reliable google to find a place in the area that serves a good fried "baloney" sandwich. They're a favorite of Old Louisville and can still be found at a few old school spots around town. But the place that kept getting mentioned more than the rest was White Castle. Available on their breakfast menu these are a regional offering and I guess pretty popular with the locals. WC still breaks eggs and cooks them to order on the flattop which shouldn't be impressive, but in the fast food world it is. As good as I imagined. Da Beef wrote: Recently in Louisville I used the ever reliable google to find a place in the area that serves a good fried "baloney" sandwich. They're a favorite of Old Louisville and can still be found at a few old school spots around town. But the place that kept getting mentioned more than the rest was White Castle. Available on their breakfast menu these are a regional offering and I guess pretty popular with the locals. WC still breaks eggs and cooks them to order on the flattop which shouldn't be impressive, but in the fast food world it is. As good as I imagined. That looks excellent. I think McDonald's cracks eggs for their Egg Mcmuffin. I like fried bologna so would definitely try this...but, I can't help but notice that in the photo, the cheese looks very unmelted looking (as in not even a little) and the meat looks not at all browned (is it even possible to brown meat on a WC grill?). 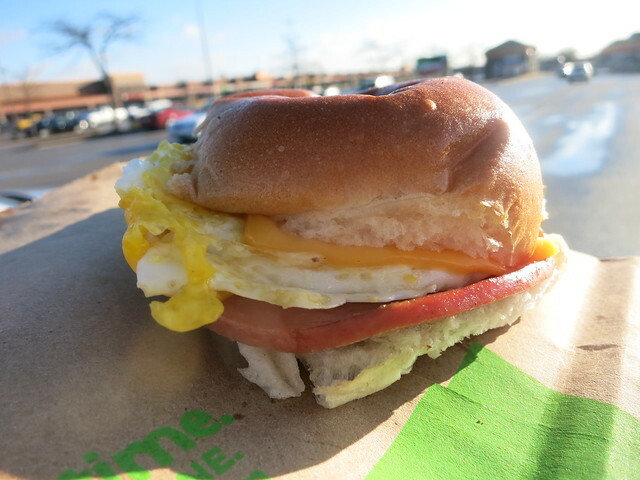 McDonald's does, indeed, use fresh cracked eggs for their sandwiches. You can actually see 'meat' in that photo? What's it next to? "You can actually see 'meat' in that photo? What's it next to?" It looks like the bologna is right below the egg. On the (relatively off-topic) topic of "people don't go to McDonald's for health food," this is true, except sometimes the people who go with the people who go to McDonald's are looking for something healthyish. This is often the case with my wife, when we stop at the golden arches on a road trip. I could see her getting a veggie burger there. riddlemay wrote: On the (relatively off-topic) topic of "people don't go to McDonald's for health food," this is true, except sometimes the people who go with the people who go to McDonald's are looking for something healthyish. This is often the case with my wife, when we stop at the golden arches on a road trip. I could see her getting a veggie burger there. And you can certainly get calorie-reasonable foods at these places. When I was dieting, a McDonald's lunch was actually part of it. id defintiely try that if they brought it to the locations up north - ill have to keep my eyes out for it when down south. I have seen that Hardees is offering a bologna breakfast biscuit, with Velveeta, from the pic I saw on their website it didnt look half as good as the WC version. As there has never been a crunchy-mushy textural contrast with the regular slider, my expectations were low for anything so good with the veggie slider. Expectations met. One would not expect crunchiness with a WC burger, but at a good hamburger place -- like Bud Willman's in Manitowoc, WI, that I visited last Thursday on Da Beef's wise rec -- there are crispy, crunchy clusters along the edges of the patties created when the beef balls are splatted against the griddle. Crunchy edges also abound @ Redhot Ranch on Ashland in Chicago. David Hammond wrote: One would not expect crunchiness with a WC burger, but at a good hamburger place -- like Bud Willman's in Manitowoc, WI, that I visited last Thursday on Da Beef's wise rec -- there are crispy, crunchy clusters along the edges of the patties created when the beef balls are splatted against the griddle. That's my favorite style of burger (the thin griddled ones with well-browned edges), but I personally wouldn't call that texture "crunchy." YMMV. This is a silly discussion, though, especially since WC does offer crunchy items on their menu where it's appropriate. I guess if WC is trying to recreate the mouthfeel of a slider with a veggie burger, it still falls short being too mushy, like putting mashed potatoes in a bun. White Castle burger patties are not "mushy." They should have a bit of firmness to them. I could live without the crunch of a veggie patty, as long as there was just a little more texture to them, like in a Morningstar patty. Or it's possible I just had a bad version of them like I did with my first experience with the sriracha chicken sandwich. I'll have to give them a second try. WC offers crunchy items? Yes, of course. WC burgers are not mushy? I did not know that. Binko wrote: We obviously have different definitions of "mushy." They're delicate, but have a clear firmness/resistance when you bite into them if you look at them objectively. We have not only different definitions of "mushy," but also different definitions of "clear," "firmness/resistance," and "objectively."